On December 5, the Consumers Electronics Net (CEN) website featured an article that announced the partnership between the global provider of mobile communications, Nokia (News - Alert), Sky Italia and Microsoft. It’s an agreement by which Sky Go, for the first time, will debut on smartphones Nokia Lumia and Windows Phone platform 8, said Remo Tebaldi, Director of Customer & Product Marketing Sky. Consumers are expected to see this change implemented starting from middle of December; this is when Sky Go will be available for all Windows Phone (News - Alert) 8 and Nokia Lumia devices in Italy. Sky Go is an award-winning pay-TV mobile service on the go; it comes at no extra cost for Sky TV customers and allows subscribers to enjoy 30 or more channels (depending on the subscription) via Wi-Fi to watch live Sky sports, movies, entertainment, and more, while outside the home on selected mobile devices, such as smartphones and tablets. It is one of the most loved applications, at the moment, by Italians to be able to see popular TV shows and films wherever they are in Italy. Nokia Corporation also reported this same news on its website. In fact, the mobile communications company Nokia Corp., which has turned over its mobile phone business to technology giant Microsoft (News - Alert), announced the arrival of Sky Go application “on the entire Lumia family stretching from the Lumia 520 to the new Lumia 1520 with its high-quality 6-inch screen,” says Paola Cavallero, General Manager, Nokia Italy. It’s an exclusive offer and a true Christmas gift for Italian consumers that are Sky subscribers, Cavallero said. She explained that the partnership with Sky “will further increase the satisfaction of [the] Italian users of Lumia devices” thanks to the addition of the possibility to view Sky's pay-TV channels on their handsets. It is sure to appeal to the potential audience that will be watching the Winter Olympics in February via their mobile platform; a recent Sky and Telecom Italia agreement, last month, brings the Sky's Sochi 2014 Winter Olympics channels to be broadcasted over TIM's Wi-Fi, broadband, 3G or 4G connections. The debut of Sky Go on Windows Phones is also “guaranteeing its users access to the best of entertainment on their smartphones as well," said Silvano Colombo, Consumer Channel Group Manager, Microsoft Italia. 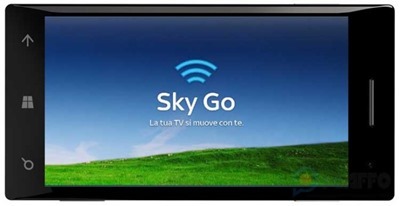 Microsoft and Nokia are both enthusiastic about the collaboration with one of the main pay-television operators, Sky, and proud that Italy has been chosen for the global debut of Sky Go on its phones, coming soon.